I used cosmo cricket papers and a Fiskars stamp that my dear friend Kari sent to me. I colored clear bling with copic markers to match. The border punch is ek success. I knew you would do awesome with those stamps!! You are proving me right!! Sorry I've been absent for a little bit - but I'm still around!!! This is VERY creative, Miss Rachel! Love your color and border treatment! Hope you are enjoying summer! I really like that font. Blessings! Super cute Rachel! Gotta love freebies!! Love the letters and the floating bling!! Thanks for playing this week at The Play Date Cafe. Such a great, happy creation, Rachel! Thanks so much for playing along with us this week at The Play Date Cafe! What a fun ATC! I've yet to try one, love that sentiment too! 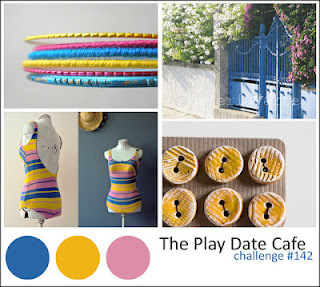 Thanks so much for joining in the fun with us over at The Play Date Cafe!